It’s been just over two months since I posted last (hard to imagine that much time has gone by! ), so I have a lot of news to share. Not long after I made that last post, on the Monday before Thanksgiving, my husband and I got a call from our daughter in Massachusetts that she was in labor and was on her way to the hospital. So excited we were all but bouncing, he and I jumped in the car for the twenty-five hour drive, expecting our grandson to be waiting for us when we arrived. We’d been on the road for several hours when our daughter reported that her labor had slowed and she’d been sent home to wait for it to intensify again. Her doctor expected to see her again later that night. 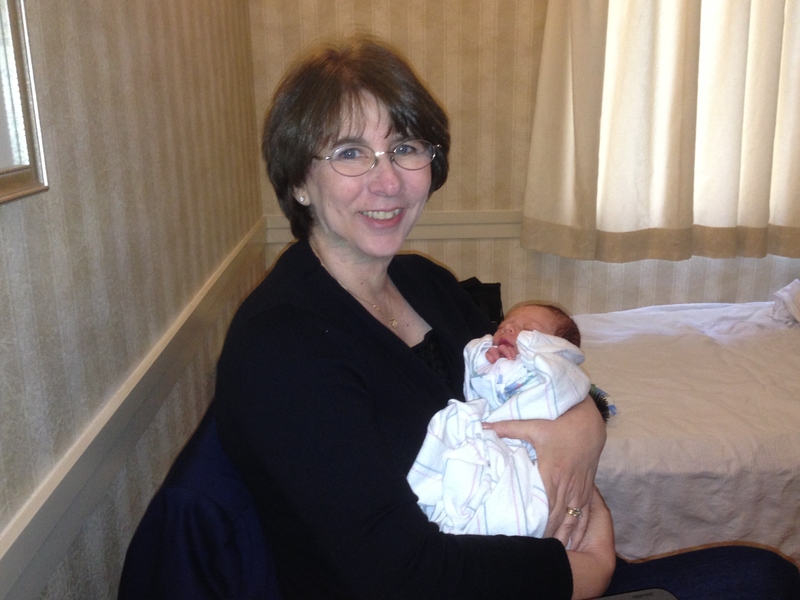 John and I began to hope that we would actually be there in the waiting room when our first grandchild was born. We spent the night in Virginia and checked in with them first thing the next morning — only to find that the contractions were still sporadic and not gaining in strength. A terrible accident ahead of us in Pennsylvania backed up traffic so badly that we moved seven miles in four and a half hours! Fortunately, we had snacks and a cooler of sodas with us, so we had a snack-food dinner, finally arriving at our daughter and son-in-law’s house at two a.m. There we settled in to wait for our grandbaby. And wait. And wait. Kind friends of theirs had us all over for Thanksgiving dinner with their families, and then the waiting began again. 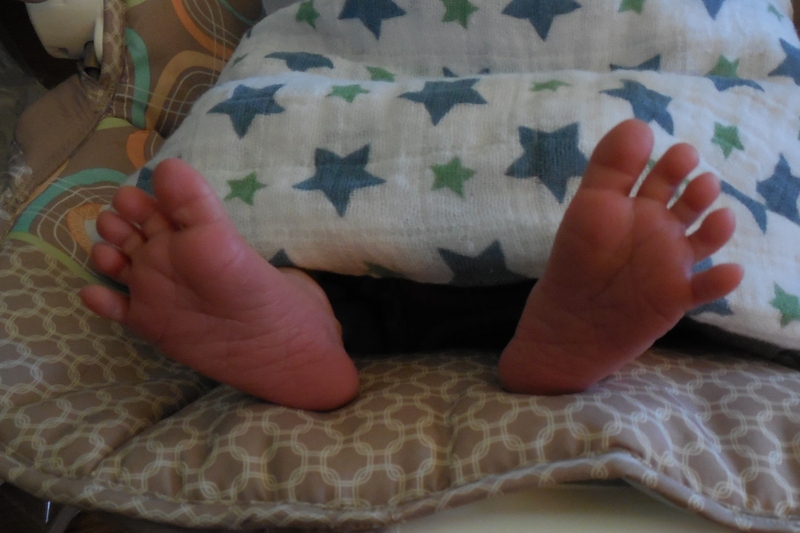 Almost three weeks after our hasty trip, our grandson chose to make his grand appearance on December 8. We were in the waiting room, as we’d hoped (another example of being careful what you wish for). We enjoyed those weeks with our daughter and son-in-law before the baby’s arrival, helping them set up the nursery, meeting many of their friends, enjoying some central Massachusetts Christmas festivities. We were able to spend one week with them after the baby’s birth before heading home again. Needless to say, we absolutely loved having that time with all three of them, and we got in lots of snuggles and kisses before we reluctantly left. The drive home was relatively uneventful, made to the soundtrack of Christmas music from the radio. Because it was so close to Christmas, I did a minimum of decorating. I still had shopping to do, and my husband was far behind in the turned wood gifts he was making. He headed straight for his lathe while I put up just one of the two trees I usually decorate. Our other daughter from Seattle arrived the day after we got home. She is still recovering amazingly well from the stroke she suffered two years ago, and we were thrilled to see how much progress she had made just since we’d last seen her only a couple months before for a dear friend’s wedding. Christmas passed in a blur of family visits and traditions, including the annual Christmas Eve candlelight service we’ve attended every year since before our children were born. We spent a quiet Christmas morning with our daughter and our son, who had spent the night with us rather than returning to his apartment some twenty miles away. Christmas Day ended with us sitting in the cold and dark — a rare Arkansas snow storm had dumped more than a foot of snow outside and shut off electricity to more than 70 percent of central Arkansas customers! We were without power for a couple of days, without internet for a few more, but we were more fortunate than some in the area who lost power for a full week. Trees and branches fell on roadways, homes and vehicles and the damage was widespread, but we lost only one small tree and a few branches, so we were fortunate. After a lovely visit, a fun day trip with us and one of her former workmates to Hot Springs National Park, lots of shopping, eating and catching up with friends and family, our daughter will return to the Pacific Northwest tomorrow and the holidays will officially be over for us. 2012 ended with quite a bang for our family! Now we’re tired, a couple pounds heavier, and somewhat behind in work and other obligations — but all in all, it was a great year. I have a busy 2013 ahead. Three new Harlequin Special Editions are scheduled for March, May and July — THE RIGHT TWIN, THE TEXAN’S SURPRISE BABY and A MATCH FOR THE SINGLE DAD. Introducing the Bell family of the fictional Bell Resort and Marina on Lake Livingston in Texas, the books also include appearances by characters from my long-running Family Found series. Don’t worry if you missed that series; these are all stand-alone stories. I’ll have other news to share in coming months, so visit me here again soon! I’ll try not to stay away so long next time. Happy New Year to all my friends and readers, and thank you for dropping by! Congratulations on the new little addition to your family!!! And thanks for the heads-up on your upcoming series. I’ve loved the Family Found stories since the first and look forward to “meeting” the Bells as well.